If you are a Jeep owner and enjoy the look of camouflage, then you might find a Jeep camo wrap to be an excellent solution. Why Use Jeep Camo Wrap? Years ago, camouflage would bring to mind images of soldiers and war. However, more recently, the unique appearance of camouflage patterns have found their way into clothing fashions, room paints and even car paint jobs. Enthusiasts in the car tuning industry often do some exotic things to modify a car. These include both minor tweaks and major changes to the engine, transmission, body and other parts of the car. One of the most popular ways that "tuners" upgrade the appearance of a car is by giving it a head-turning paint job. In recent years, there are more camouflage designs showing up on the body of tuners' cars. The only time Jeep owners would go through the expense and effort of camouflaging their Jeep is if it would be used often as an off-road vehicle for activities like backwoods hunting or expeditions. The difficulty in painting camouflage onto a vehicle comes from the fact that several layers are required. Not only do you need to go through the normal process of stripping, sanding and creating an appropriate base for the paint, but the camo paint job is also permanent. Once you make the change, your vehicle will forever be a camouflaged car. Additionally, the process of painting the base camouflage color and then repeating layers of similar shades into the camo design is a tedious and difficult process. 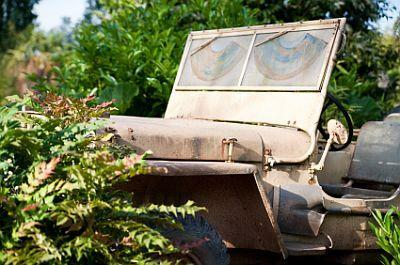 Jeep owners in particular are often drivers who appreciate a camouflaged vehicle. This is because Jeep owners usually take part in activities where a camouflaged vehicle is advantageous. Many Jeep owners are avid hunters. Even more Jeep owners are part of a large underground community of "off-roaders" who spend their weekends going "mudding" or exploring lands where there are no roads. This community likes the appearance of camo, not only because mud and dirt don't show up quite as well on the pattern but because it looks so cool. What Is a Jeep Camo Wrap? A car wrap is an innovative vinyl material that adheres to the surface of a vehicle body in the form of a film. This film coating completely covers up the original body paint and transforms the vehicle into what looks like a brand new Army vehicle. Off-road drivers also love the fact that the film also acts as a paint protectant from the brush and small tree branches that often scratch the paint on an off-road Jeep. Best of all, most vinyl wraps are designed to adhere only temporarily. Once you're finished with the wrap, you can remove it, and your original paint job is still as good as new. Are you ready to try a vinyl camouflage wrap on your own Jeep? You can join the ranks of other Jeep drivers who enjoy camouflage by applying the wrap yourself. It isn't extremely difficult, but you do need the right tools. You should set aside an entire afternoon so that you have plenty of time to do the job carefully and methodically. After you purchase one of the wrap kits, you can apply it to your vehicle using the installation steps below. Before you start, make sure you have low-tack masking tape, a felt squeegee, a craft knife, a heat gun, and a hard flat tool that you can use to release bubbles. Wash your vehicle well and make sure to remove all dirt and grime. Remove all stickers and emblems on the body of your Jeep. Finish off washing your car by rubbing a thin film of isopropyl alcohol to remove remaining residue. Starting at the back of your vehicle, hold the wrap against the Jeep to check for size. Once you're sure the size is large enough, tape the strip in place with masking tape. You'll be applying the wrap one section at a time. From where the tape is holding the wrap, peel off the backing and apply your squeegee to the top of the wrap as you slowly move down to the bottom of the body. Push your squeegee from the center of the section toward the outer edges of the vinyl wrap until all bubbles and wrinkles are gone. Trim the edges of the vinyl so that it perfectly matches the body of your Jeep and carve around any obstructions like mirrors or door handles. If there are any bubbles left, use a small pin to pop them and then squeegee any remaining air out of them by pushing the bubbles toward the hole. Finally, you can use a low temperature heat gun and paint brush to smooth out any remaining wrinkles in the material. Whenever applying the next piece of wrap, always overlap pieces about a quarter of an inch and apply the heat gun to make sure they are sealed together. After you've installed your new camo wrap, you can enjoy driving your Jeep around knowing that not only does it look awesome, you're also preserving the original paint job. This means your Jeep will look great for many years to come.